Porsche 911 Turbo has been unveiled as the new safety car supplier for WEC. It will replace the Audi R8 V10 as the official safety car of WEC. 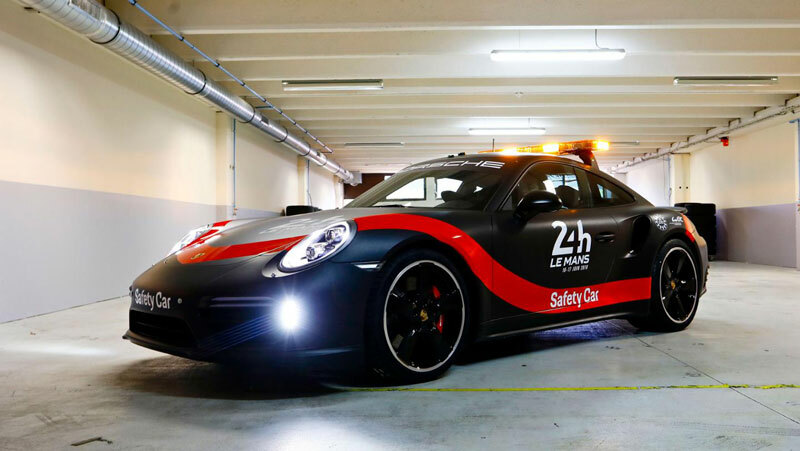 The safety car will have the important job of ensuring the safety of the race cars and guiding them around the track in the case of bad weather or obstructions along the track such as car accidents. Choosing the Porsche 911 was an easy choice to make. The car boasts an impressive 3.8 liter, twin-turbocharged flat-six engine. The engine has a horsepower of 540 and can accelerate to 60 m/h within 2.9 seconds. That along with the fact that it has a top speed of 198 m/h makes it an understandable choice. The Porsche 911s that are being used are much like the factory models. The cars come fitted with the Sport Chrono Package. This system enhances the performance of the car by tuning its engine, transmission and suspension quickly – ensuring a speedy response and swift shifting times. The safety car is largely based on the original model of the Turbo 911. However, it will have to undergo a few modifications to ensure that it is race-ready and meets the requirements to be a safety car. The modified car will have a light bar fixed onto the roof that will inform racers of the status of the track, flashing lights in the front and the back, a radio system that communicates directly with the race director and a monitor to show track signals and the position of the car on the track. The cars will be fitted with racing seats with 6-point harnesses for both the driver and the front passenger. In addition, they come equipped with Michelin Pilot Sport Cup 2 Tires which are 20-inch track-biased tires. The brakes have been optimized to suit the race track suspension. The body of the car has a matte black finish with glossy red stripes to bring the look together. The design is based on the emblem of the factory race car. Porsche is providing 16 safety cars for the WEC. Two of the 911 Turbo safety cars will be used at all the endurance races worldwide. Three of these cars will be used exclusively at the Le Mans. The other 11 cars will be used as intervention cars. These 11 cars will be made up of a number of different Porsche models. Various Porsche cars will be used by race medics and track safety personnel. The leading car at the WEC will be driven by official WEC safety car driver and former GT3 racer Pedro Couceiro while the leading car at the Le Mans will be driven by four-time Le Mans winner Yannick Dalmas. The year’s season of the FIA World Endurance Championship started with the Spa-Francorchamps event in Belgium on May 5. The 24 Hours of Le Mans begins at Circuit de la Sarthe in France on June 16-17.